Stuck inside during a blizzard yesterday, I thought I would try to create one of those football garlands I've seen all over Pinterest for the Superbowl. 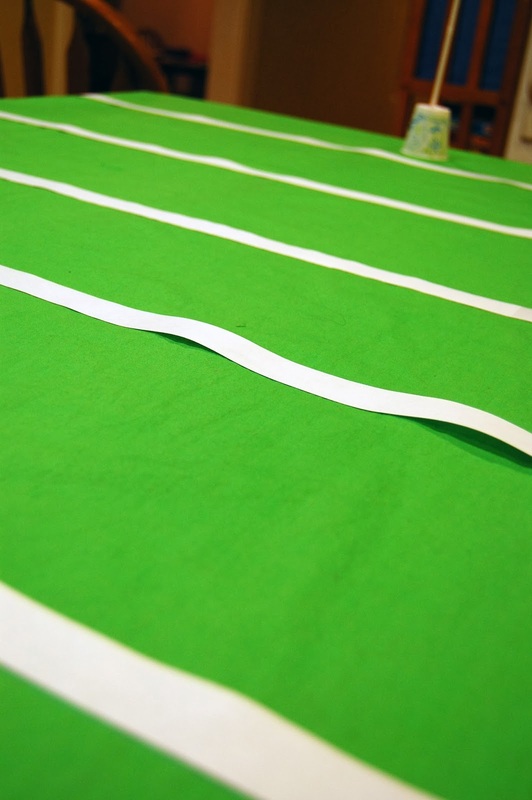 I enlisted the help of my 3 year old who loves using glue sticks to create crafts, we had a fun time put the footballs together, but it did not turn out quite as we planned. 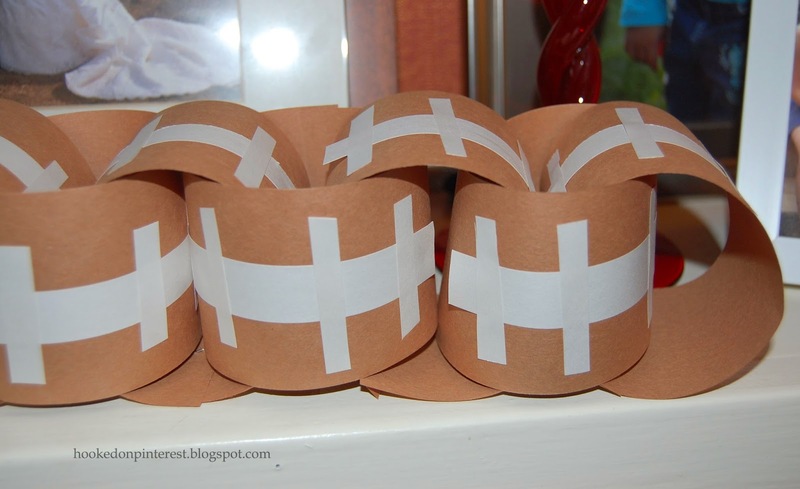 I created the garland from brown and white construction paper, glue sticks, scissors and a stapler. The concept seemed easy, but turned into a Pinterest Fail. I cut out all the pieces ahead of time, so that my 3 year old would not get impatient. 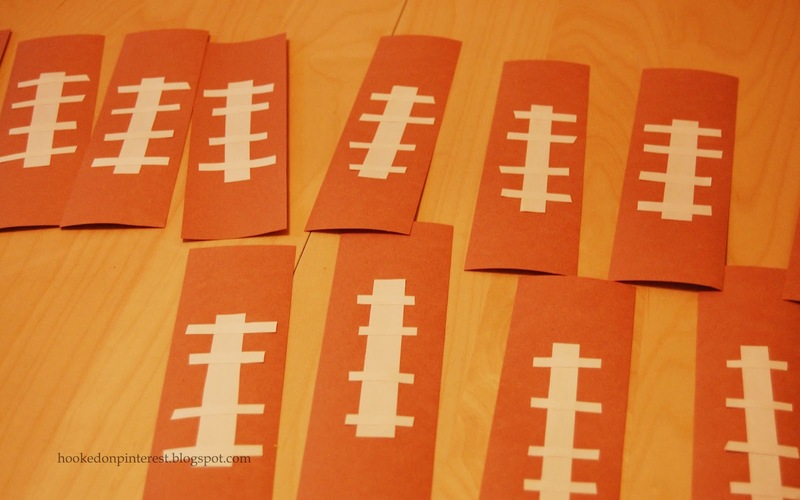 We ended up with a bunch of sticks of football like strips of paper. Then I stapled them together to create the garland. I do not think that it really looks like football. I think that I should have made the strips a little longer and thinner. Has anyone else attempted to make one of these before? Please share your experience in the comments. I had every intention of posting another fun new DIY project this morning. Unfortunately, we were snowed in on Saturday and I could not get out to gather the supplies that I needed. Instead, I'll be going today to get the supplies and hopefully have a new project to share with all of you on Wednesday. 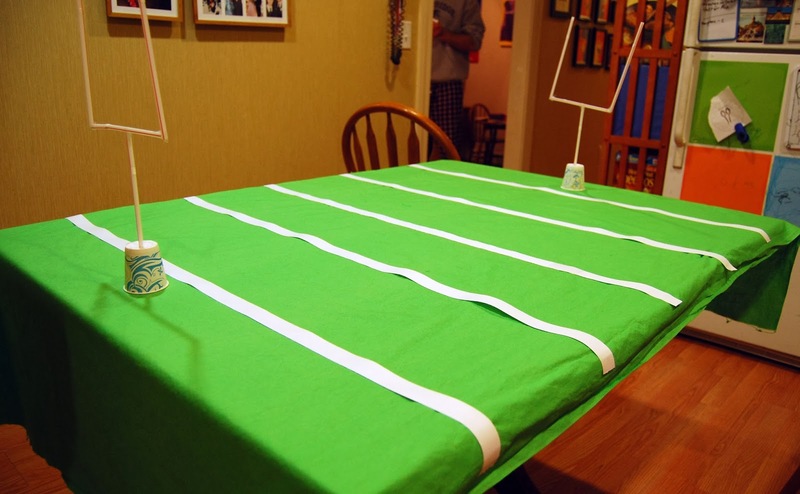 I love decorating our house for holidays and special events, such as the Superbowl. 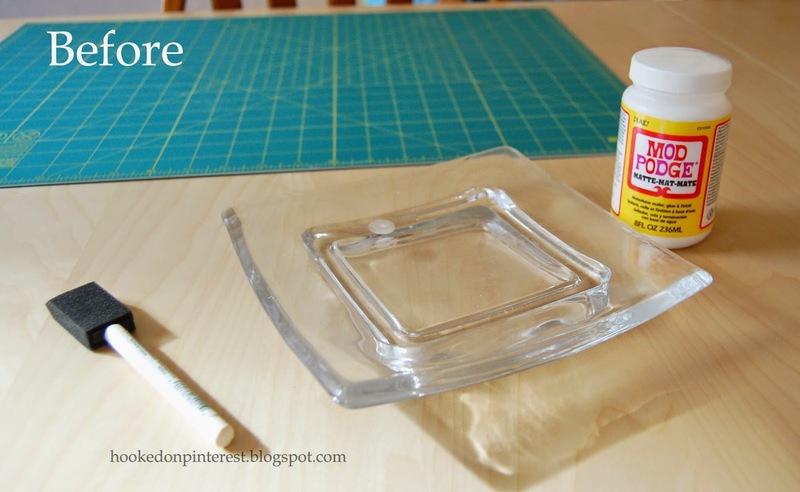 Decorating can be costly, so before I go out and purchase decorating supplies I try to find items around my house that I can make into decorations. 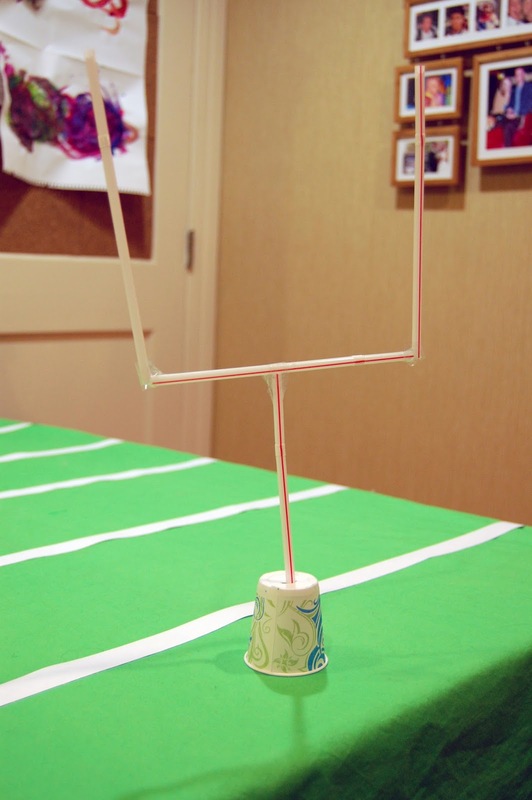 The Superbowl is this Sunday night, I decided to dress up my table with uprights and a football field. 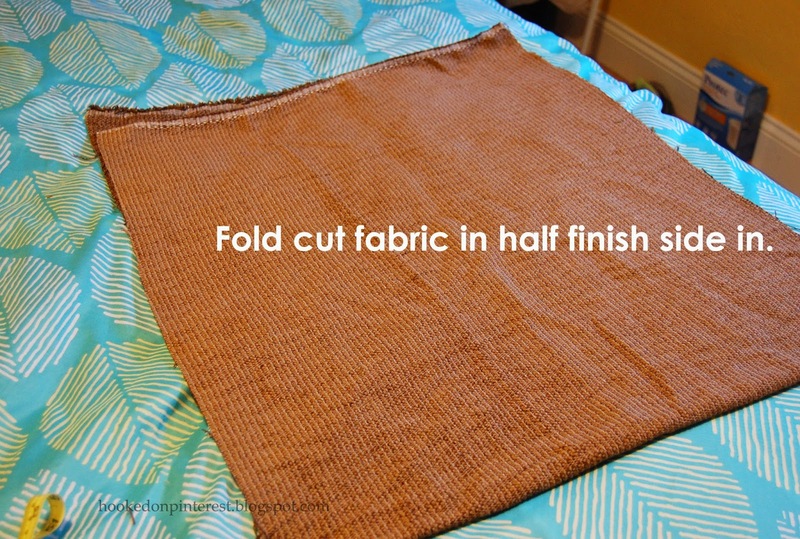 I saw a few different versions of this on Pinterest, then I started looking at what I had that would create this look. I think is will look even better on Sunday with lots of yummy food! Starting to get ready for the Superbowl, only a week from this coming Sunday. Our team, the New England Patriots, are in the Superbowl this year. We are really getting excited, even though the deflate-gate that is going on. 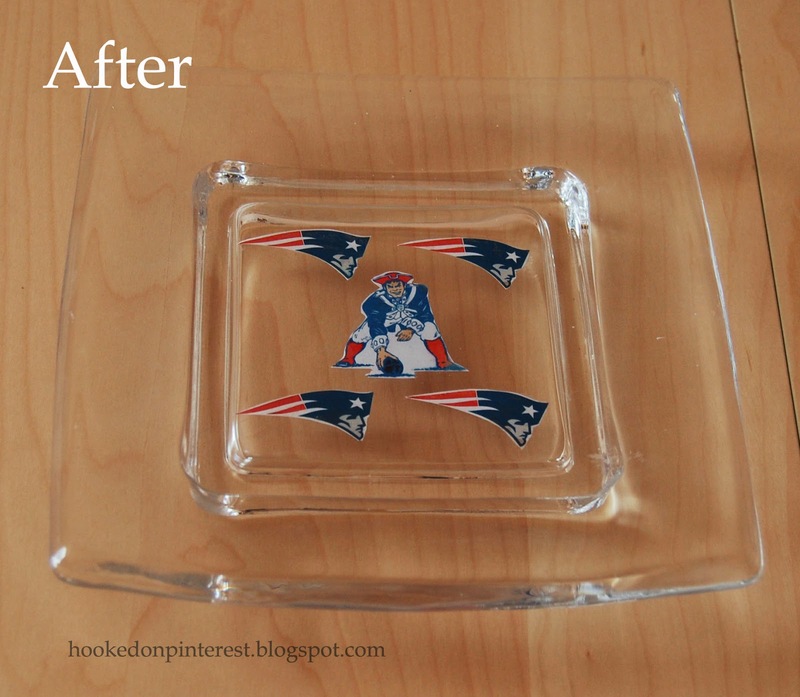 I thought I would start my Superbowl preparation with a quick, fun Patriots themed project. 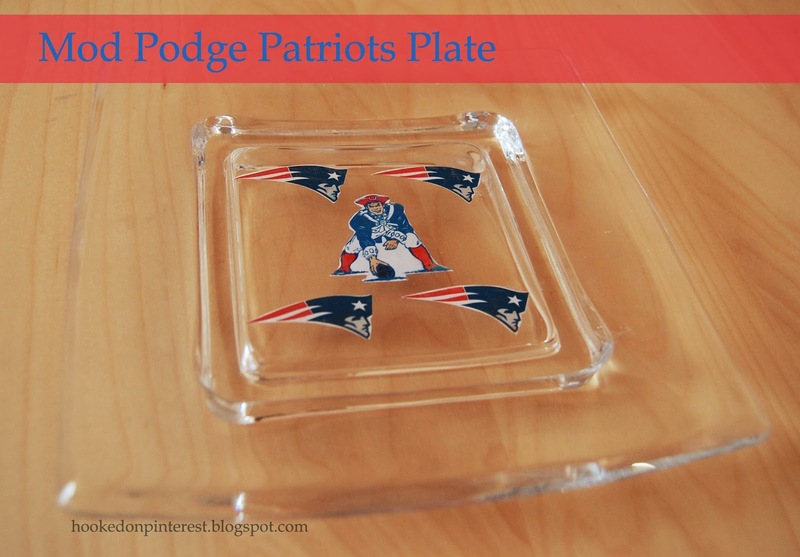 I grabbed a old plate that I had in my attic, some Mod Podge and printed out some Patriots logos. It took me about 5 minutes to complete and now I have a fun addition to my Superbowl table. 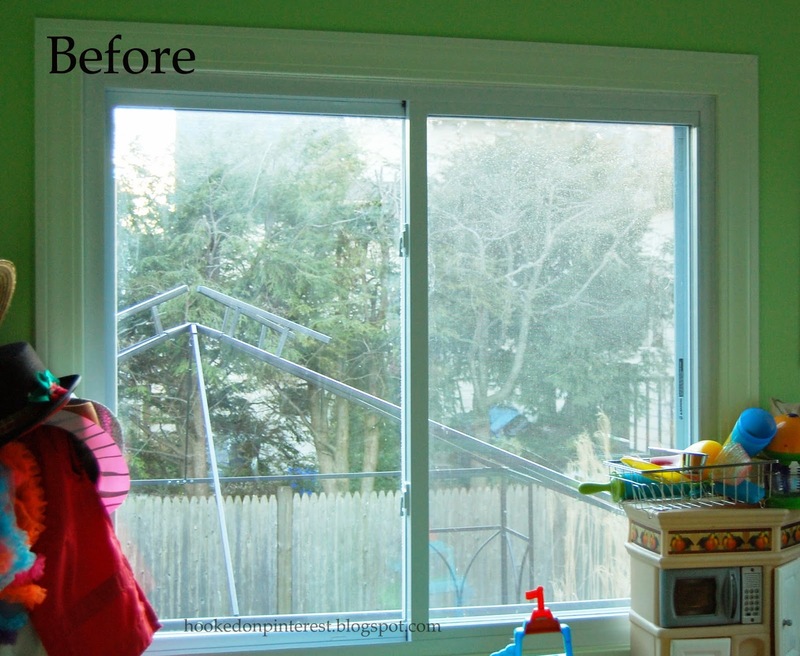 Our kids playroom window is really big and gives the room great light. But, at certain times of the day it can be a real pain because of the glare, especially now in the winter when the sun is lower in the sky. 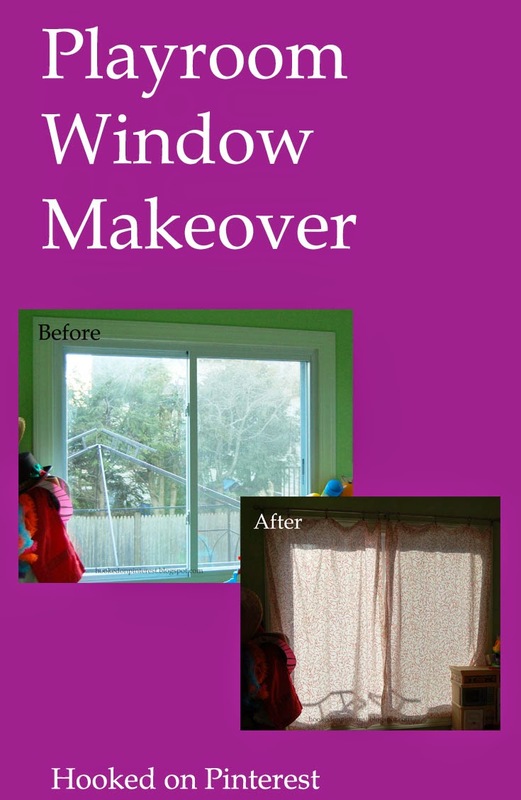 I have not had a shade of any kind on the window to this point because I just could not decide on what I liked. 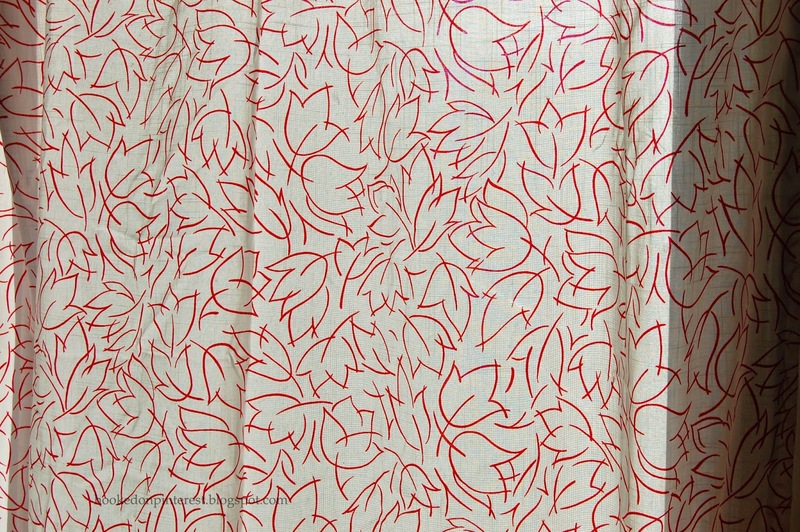 I finally bit the bullet and made two sheer panels from some lightweight fabric that my grandmother had left over. 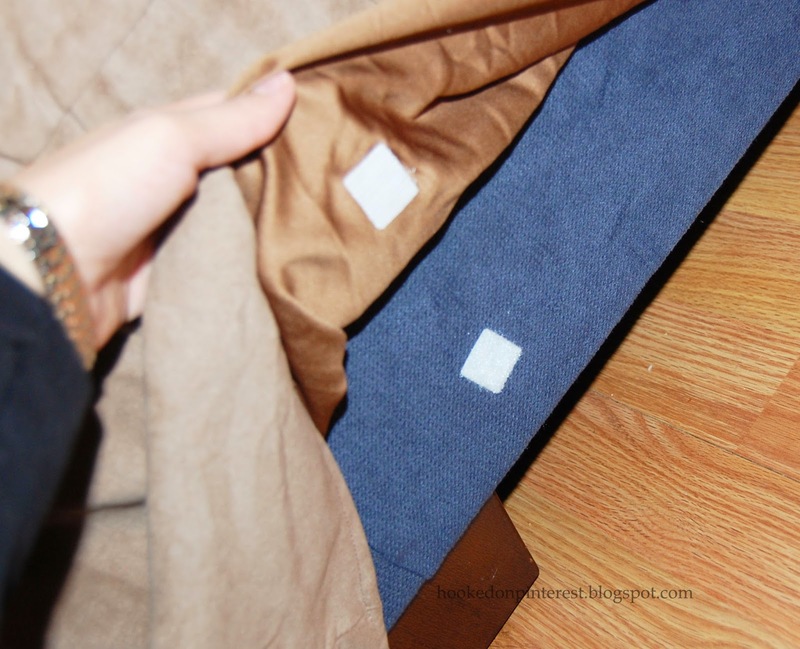 These panels were really easy and quick to create, well quick once I got my sewing machine working correctly, the tension was incorrect and it kept catching. 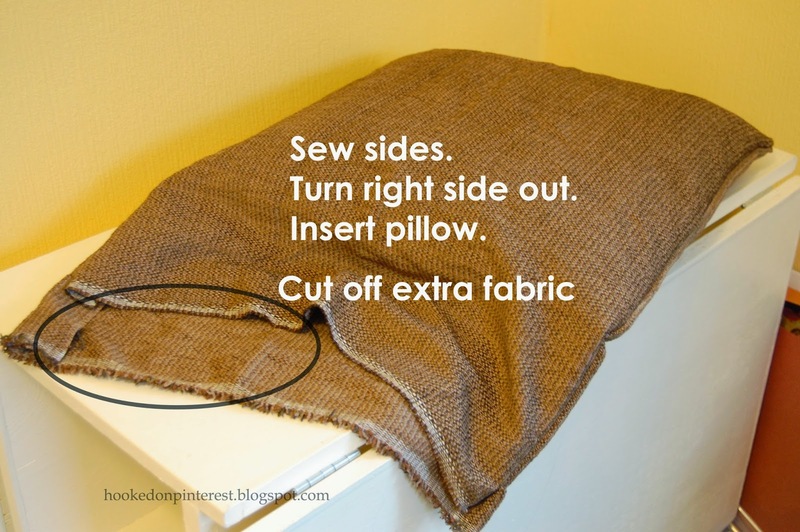 To create these, cut the fabric to the right size, sew hems on all sides to get a finished look and use curtain clips to hang the panels. 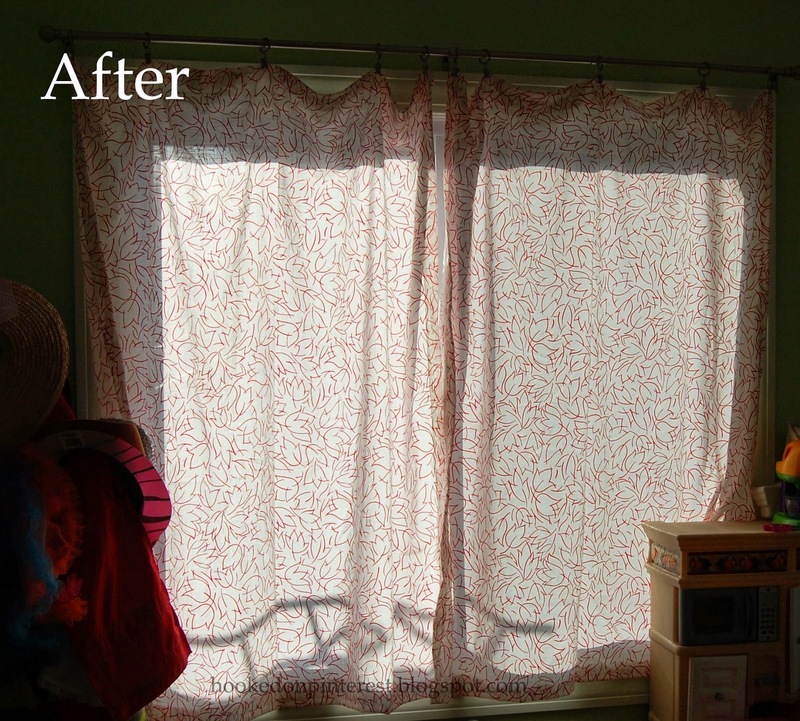 Now we can enjoy the playroom all afternoon, without being blinded by the sun. 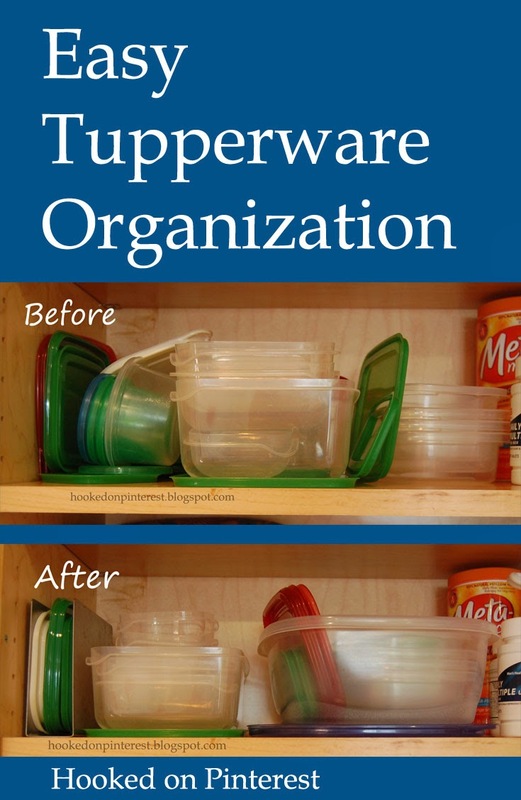 My Tupperware collection is always getting unorganized and unruly. I try to keep it in check but it always seems to go back to the disorganized mess that you'll see in my before photo. This time I think that I have solved my problem, well at least I hope so. Here is my most recent attempt to organize. So, here is what I did. I grabbed 2 larger containers that I had bought for something else a while and used them to contain most of the containers and lids. To store the rest of the lids I grabbed a old napkin holder I had in my attic and they fit perfectly. 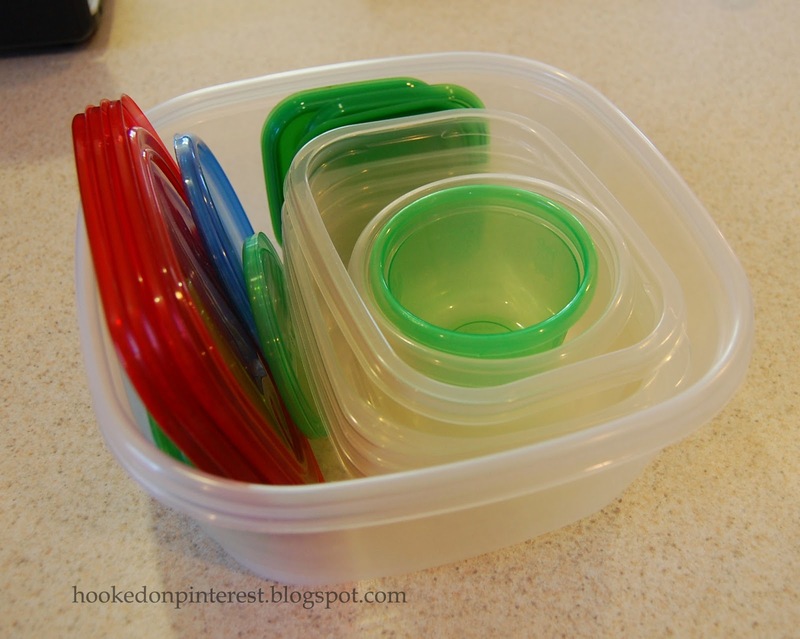 I also stored the lids to the two large containers underneath them, so that they would not get lost. I think this will solve my problem, but only time will tell. 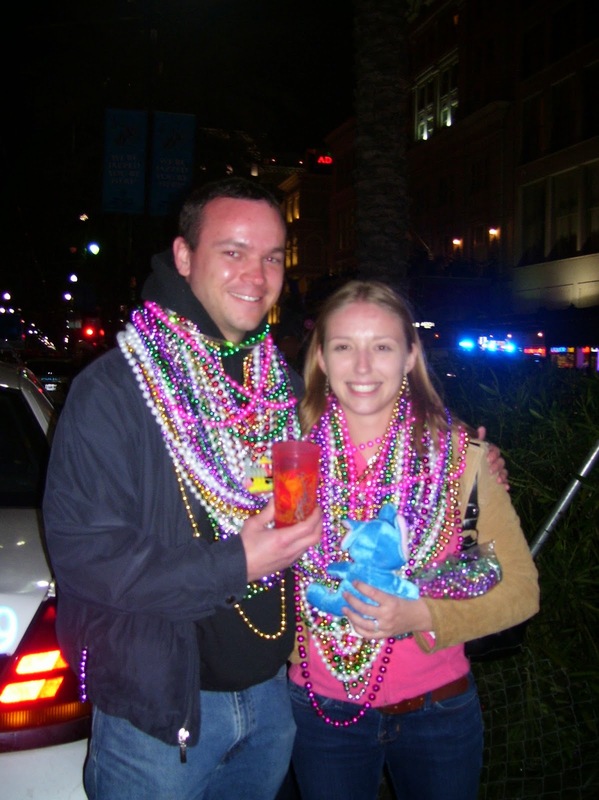 Before we had kids me and my husband went to New Orleans for Mardi Gras. It was really fun, we went to all the parades and grabbed a bunch of beads that they were throwing from the floats, no need to do anything elicit. Pic of me and my husband Mardi Gras before kids. 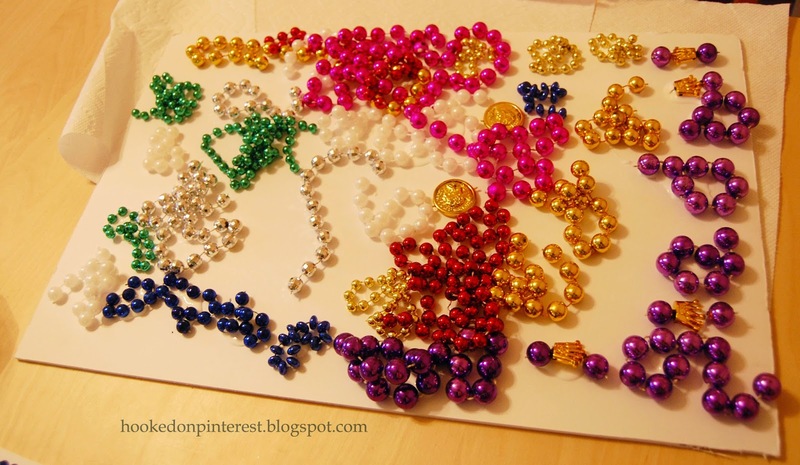 We brought the beads home and I have used them for fun projects. I created a couple of wreaths and various other decorative items. 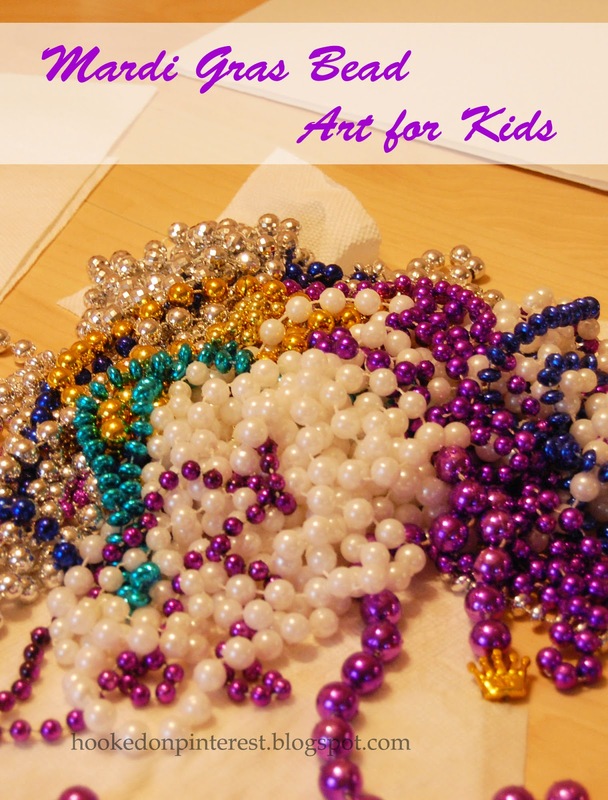 I thought it might be time to bring them out again and create some fun art with my daughter. This craft/art project was more focused on the process, then the outcome. I gave my 3 year old free reign to create anything she wanted on a piece of foam board, beads and glue. Here is what she came up with. 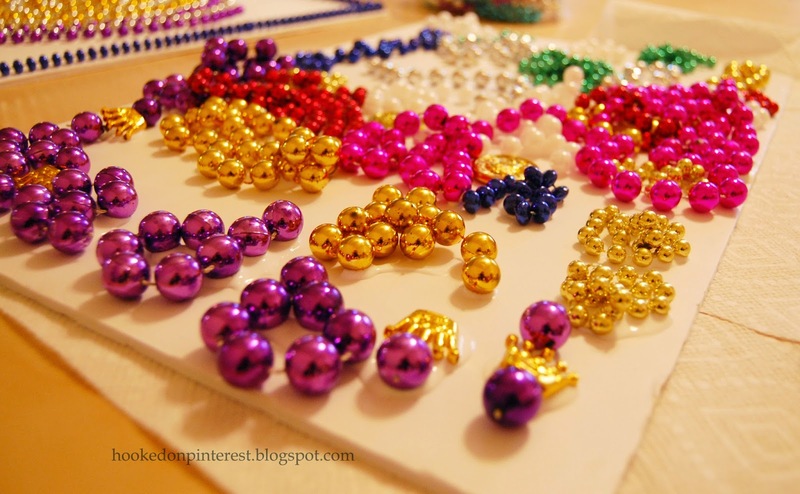 Just in case you don't have Mardi Gras beads on hand you can get them cheap on Amazon. I'm always looking for ways to organize my small house so that it feels more spacious and tidy. Since I had bought some Velcro for my TV remote project (Velcro Remote Storage) I thought I would try to use more of it to organize my bathroom sink. Our sink is rather small with not much space for stuff. Here is a picture of before I organized. Pretty cluttered and not that easy to clean. Now her is what it looks like after I organized. 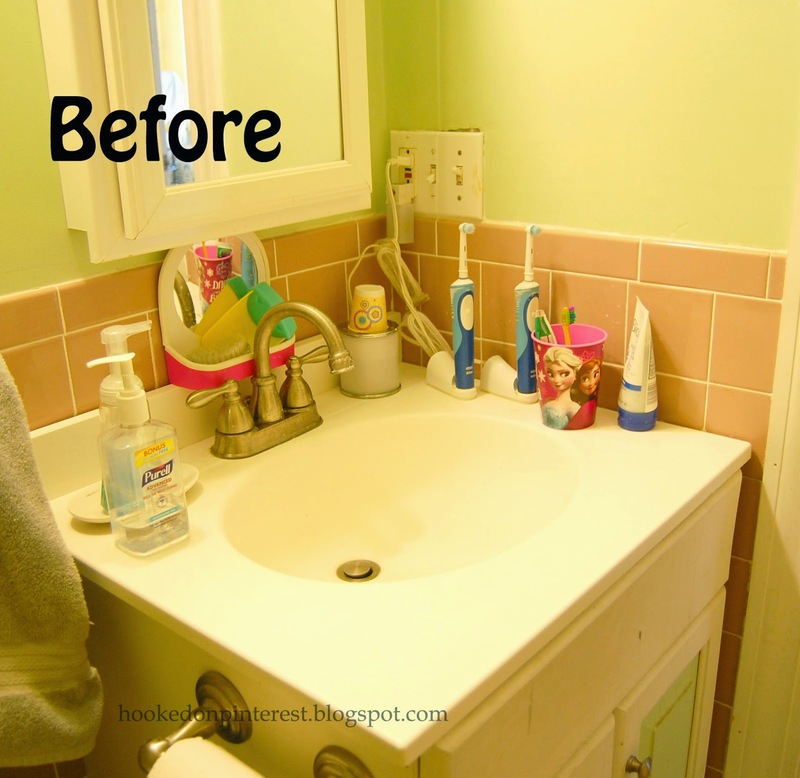 I gained a decent amount of counter space and it is much easier to clean. So, her is what I did. 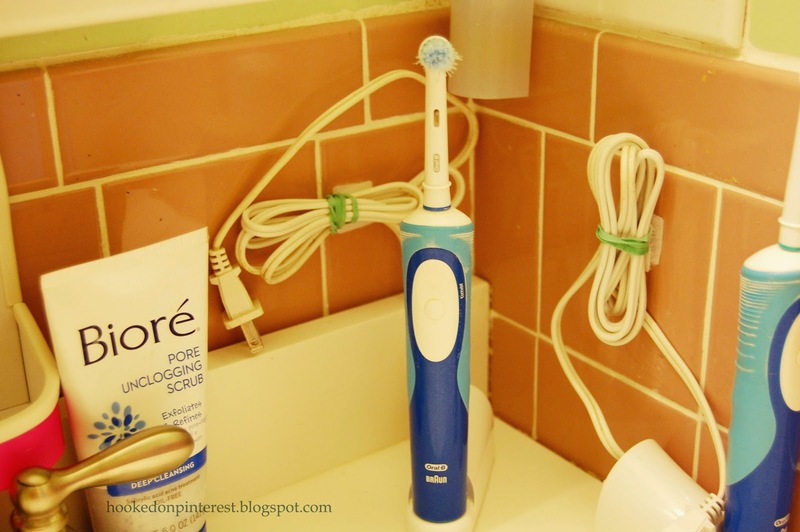 I took the cords from our electric toothbrushes and used elastic bands, so they would take up less space. 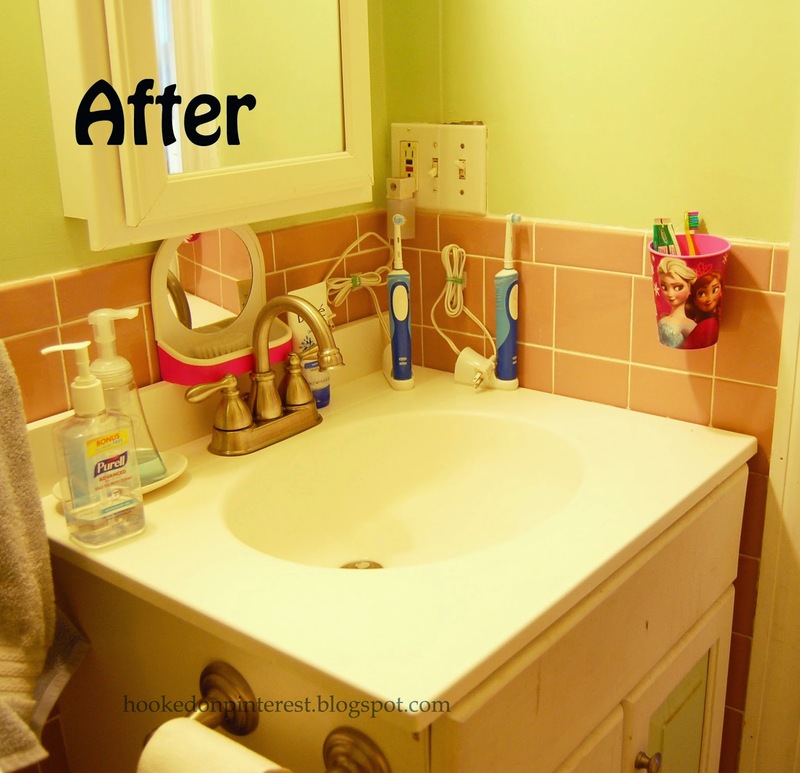 I also used Velcro to stick the cords to the tile so that they would not clutter the counter. 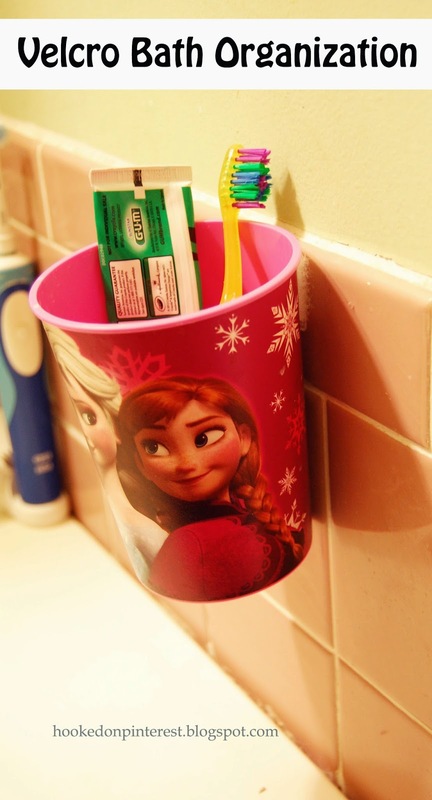 Lastly, I found this dishwasher safe plastic cup for a $1 at Target, Frozen themed of course, to hold all my daughter's tooth brushing stuff. I used Velcro to attach it to the tile wall to free up counter space. 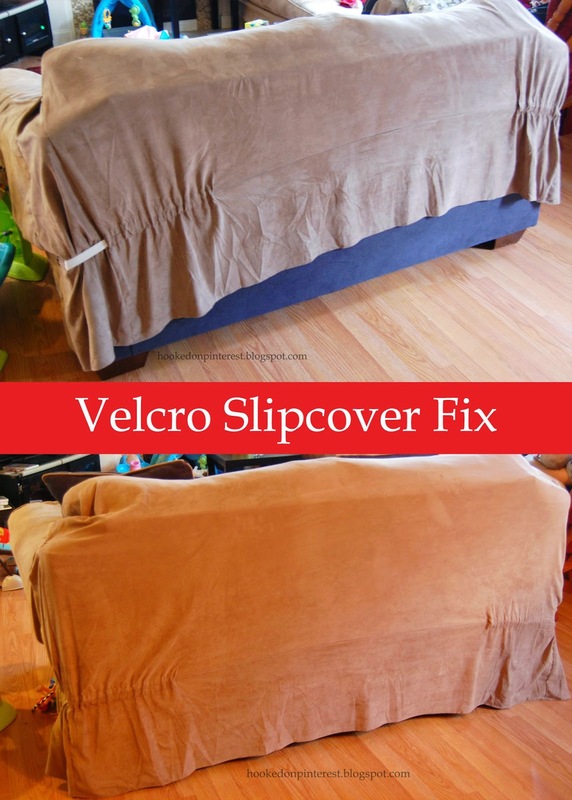 If any of you read my blog last week you would know that I posted a quick and easy way to fix your sofa slipcover with Velcro. 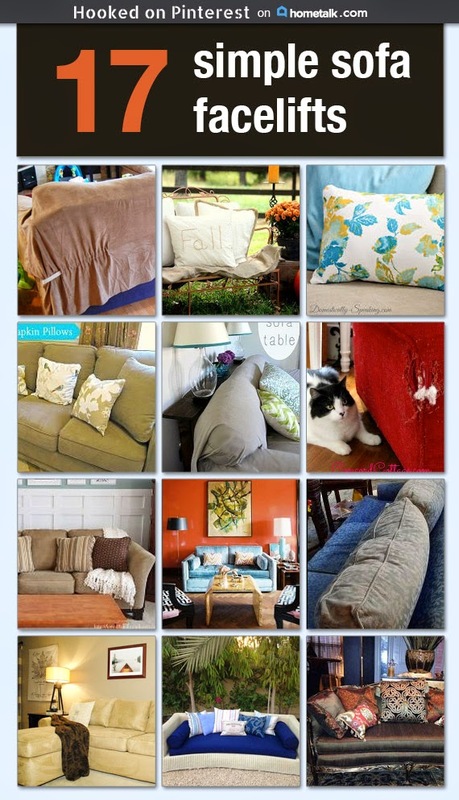 After posting the tutorial on Hometalk, a really fun website for DIYers to share their transformations, the people of Hometalk approached me to curate a board of similar posts. I was so flattered, as soon as I could I got right to work. 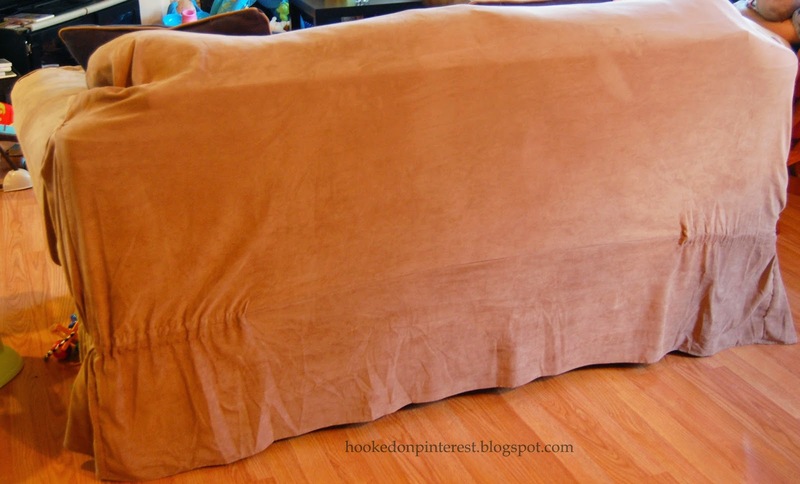 There are so many great home improvement/diyer bloggers who post on Hometalk, it was not hard to come up with a really useful board of sofa facelifts. Alright, lets get to it. For the longest time I have had a piece of extra upholstery fabric from when we created our headboard, over a year ago. 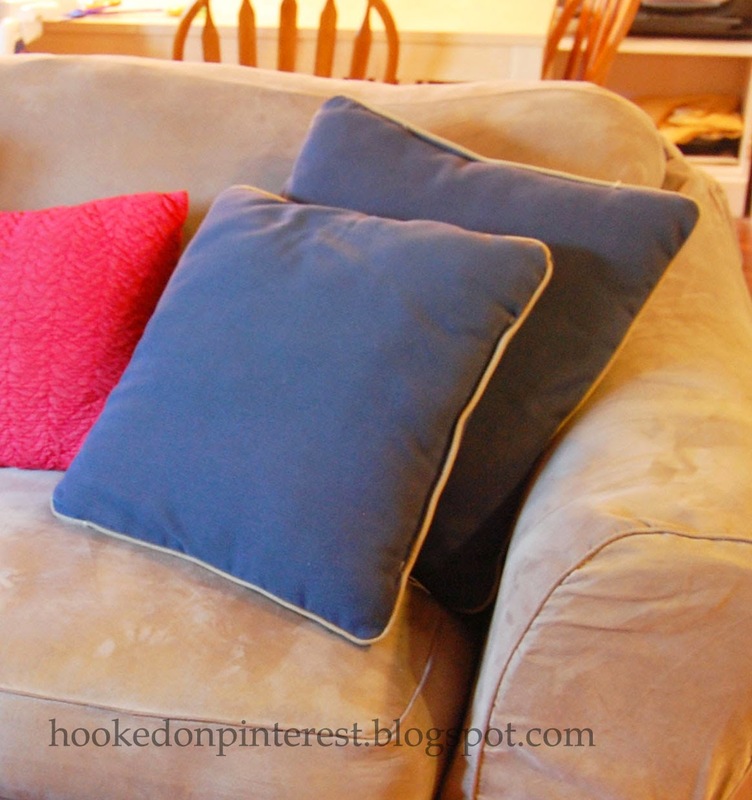 (See that here: Pinterest Home Improvement: Headboards) I finally decided that I would cover 2 of the 4 of my old sofa pillows, ones that came with the sofa. 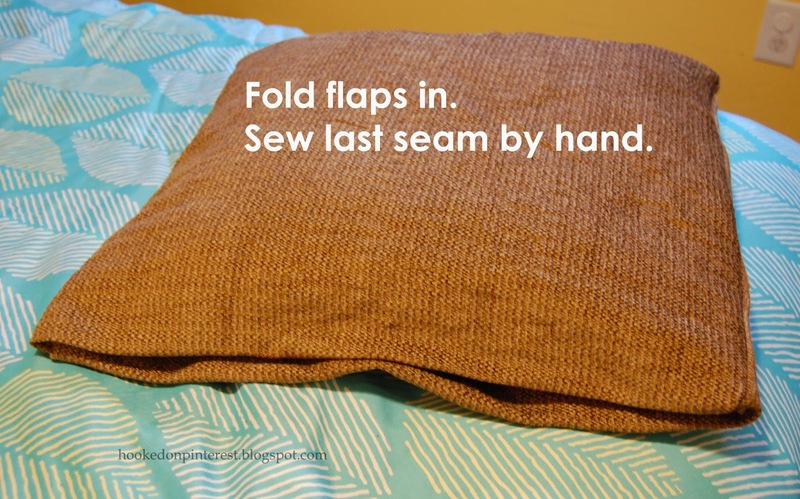 This project took me 1/2 hour to make and $0 dollars, since I used fabric that I already had from my headboard project. I usually get my fabric from Zimman's in Lynn, MA, but, Amazon has some fun upholstery fabric for sale. 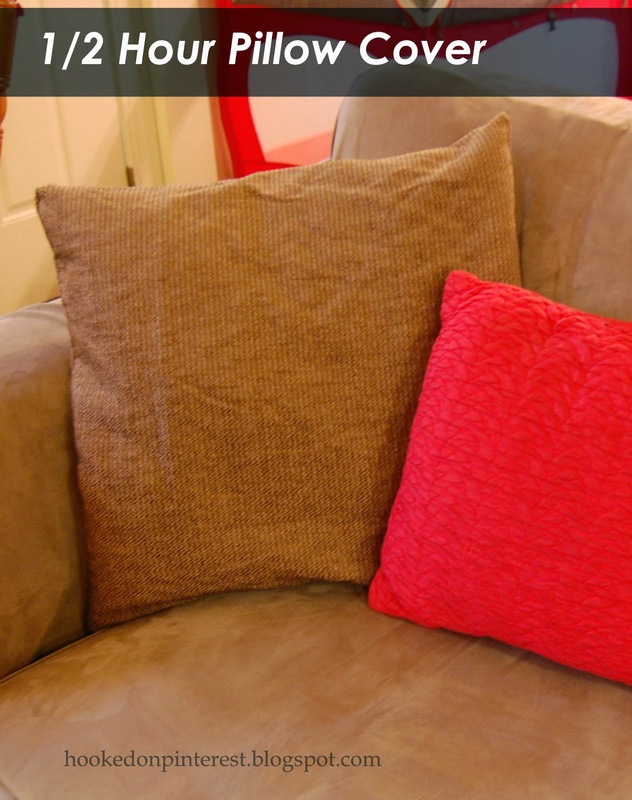 After measuring the pillow and fabric here are the steps that I took to finish the pillow cover. I hate when I can not find the right remote to turn the TV to the DVD player or the actual DVD remote. Unlike the cable remote, these other remotes are not used everyday and have a tendency to go missing. 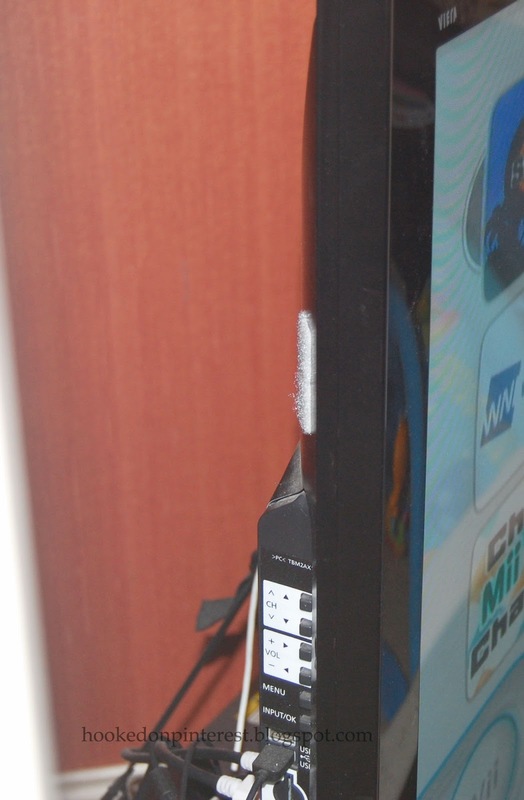 A some point over the last year and a half, I saw someone of Pinterest use Velcro to attach their remotes to the back of their TV. 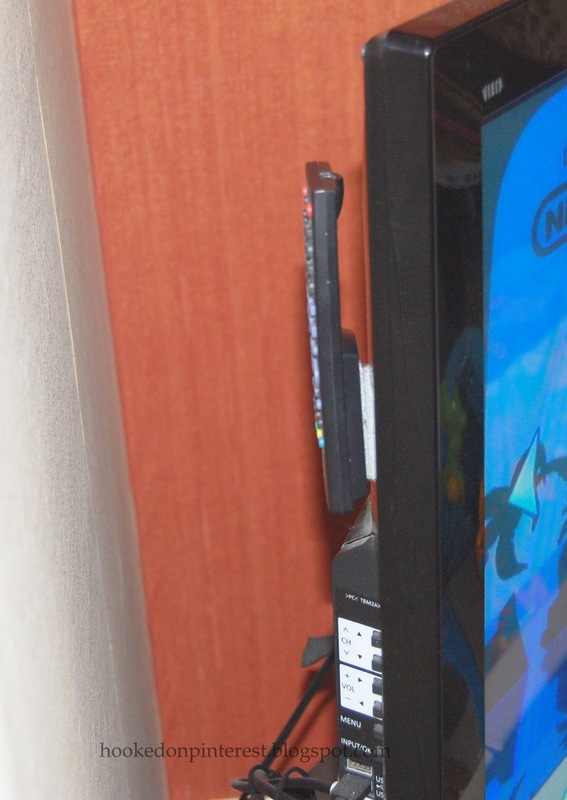 This took a total of 1 minute and is working great, we never lose our remotes anymore and the Velcro is staying attached to the TV and the remote. I would recommend this storage tip to anyone. 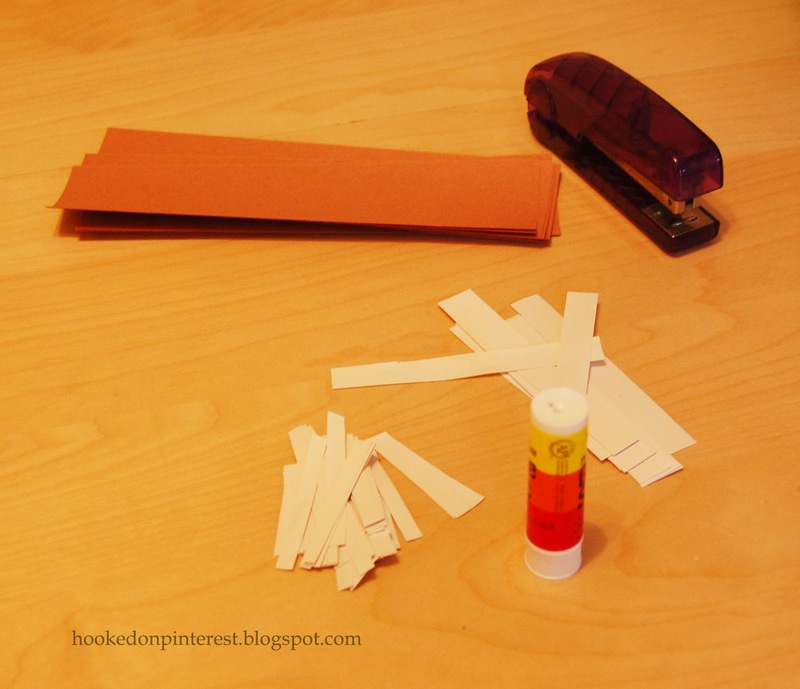 Here is some really easy Velcro to use just peel and stick. 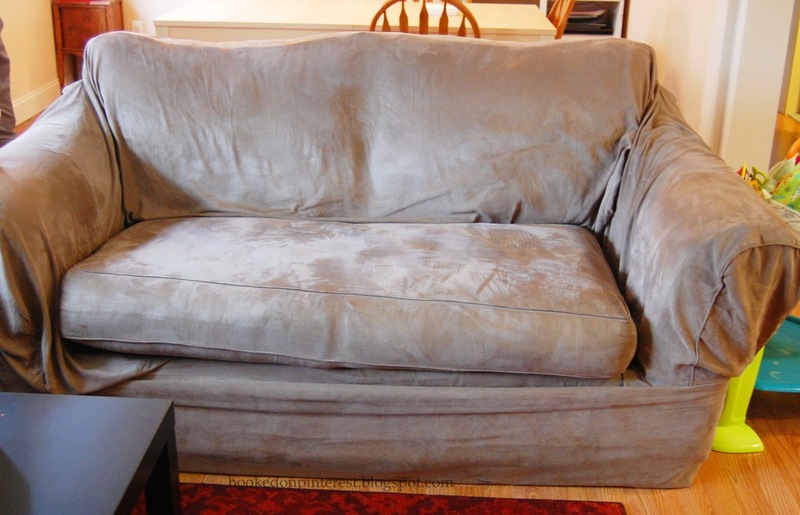 About a year ago I bought a Sure Fit slipcover for my sofa and love seat in my living room, our living room seating was pretty beat up and needed a lift. 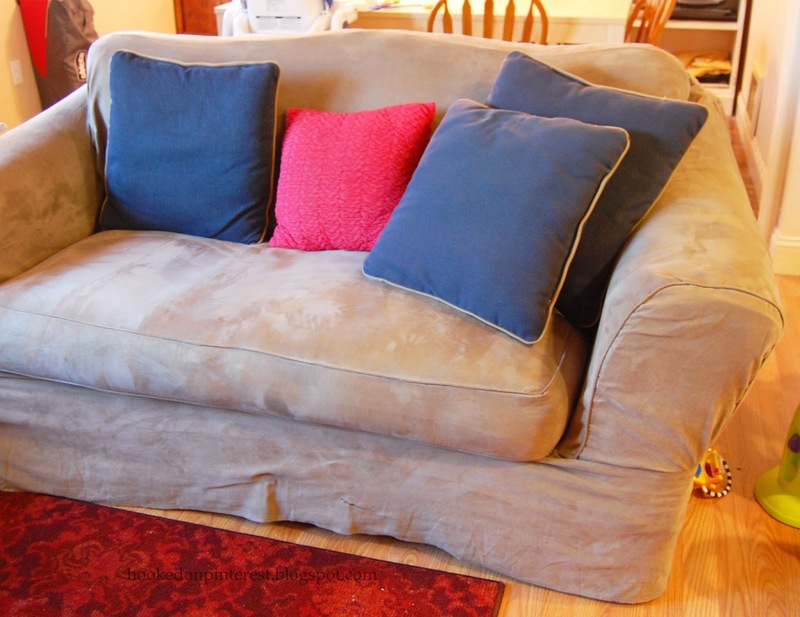 At first it seemed like the slipcover was staying in place, but after a while it started to sag and bunch up. This might of had something to do with my 3 year old jumping around on the furniture. I started to think about how I could fix this problem without having to buy new slipcovers, or make new slipcovers. 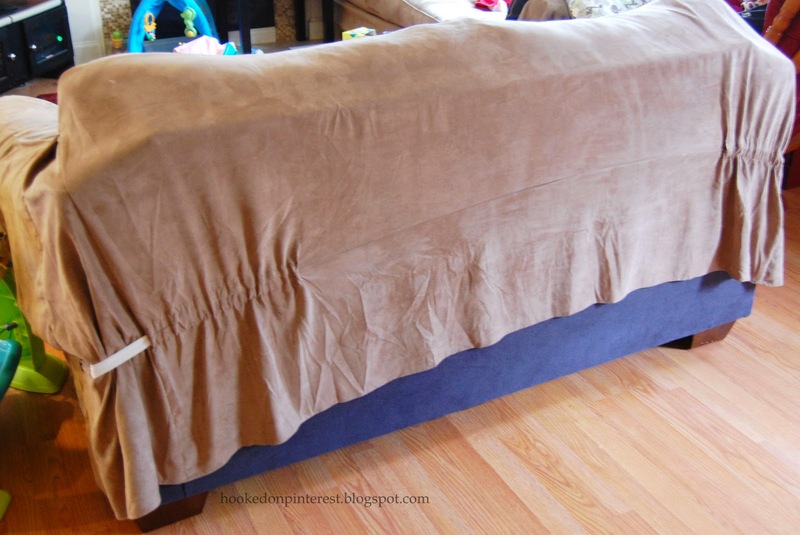 I finally came up with attaching Velcro to the sofas and the slipcovers to keep them in place. If you are looking for decently priced try Slipcovers on Amazon . 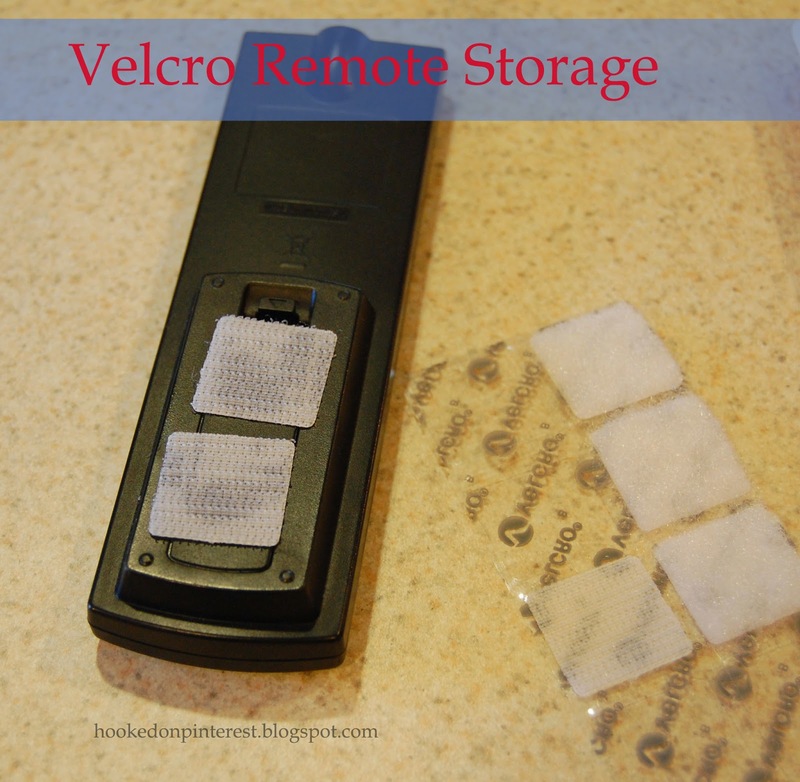 Make sure you get Velcro that is made for fabric, otherwise it will not stick. These after pictures were taken a few days after finishing this project, it seems to be taking all the abuse that a 3 year old can dish out.